Greetings from eWIT (Empowering Women in IT)! eWIT is a voluntary, not-for-profit forum addressing the need to increase the share and sustainability of women in the IT/ITES industry since 2006. Over the last 7 years, eWIT has handled programs in the form of workshops, technical talks & networking events for women in IT. As a leading forum whose outlook is to increase share of women in the corporate world, eWIT has for long wanted to bring out a newsletter which highlights important global perspectives and topics which would be of interest to fellow supporters like us. This is the first newsletter — brought out by eWIT and would be a regular feature for you to watch out for. 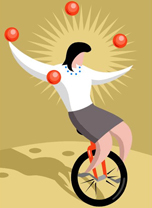 A humble attempt to showcase the wonderful way women manage work life balance also be successful at their work place. This newsletter is the beginning of many more ways of being connected to what is happening at eWIT. eWIT plans to increase the online presence—with frequent updates on the facebook & LinkedIn pages as well as an eWIT blog, which would be an interactive way to be in touch with eWIT supporters & members at all times. 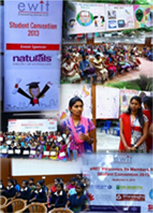 The eWIT Students’ Convention 2013 themed as “Tomorrow is (Y)ours” drew over 300 women students from various colleges in Chennai and other parts of Tamil Nadu. The full day event enthused the participants with various activities such as Poster Competition, Paper presentation & panel discussions. Chief Guest – Mr.Ramaraj, Senior Advisor at Sequoia Capital kickstarted the mood with an inspiring speech about the 3 Cs needed for success : Consistency of purpose (set a goal for yourself), Curiosity to learn - be ahead of the curve and Cooperation - teamwork. He also emphasized students that they should “work with initiatives & not for incentives”. Panel discussion on the theme : Tomorrow is (Y)Ours had distinguished members of the corporate world representing Diversity and left the audience with the thought - How important it is to differentiate oneself to reach the top. Panel discussion Your Questions Answered comprised of members from different IT organisations & the student community. The students got to ask questions about working in an IT/ITES organization. The key takeaway for the students was that : It is important to work for experiences and not for a salary! The highlight of the day was the Poster Competition on the topic : Gadgets for communication in 2020. More than 30 teams from colleges all over Tamil Nadu presented their posters on the topic.The posters were evaluated by noted professionals in the Mobile communications space. More than 30 teams from colleges all over Tamil Nadu presented their posters on the topic. eWIT presented to Ms Karen Peetz, President, BNY Mellon, while she visited Chennai on Oct 1, 2013 to inaugurate iNautix’s new facility. Ms Viji Rao, who spoke on behalf of eWIT, presented the share of Women in Indian IT industry, where there is a steep pyramid with less than 7% of women at the senior levels despite a healthy 50% of women at the entry level positions existed. She went to talk about the causes for this leaking pipeline, the typical challenges that women face as they progress in their careers, both professional and personal. She addressed the critical processes that need to be implemented in organizations in order to have a healthy gender diversity at every level of the company and spoke on various best practices that are in place with regard to gender diversity across the IT industry in India. She also touched upon the unique cultural challenges that women have in India that keeps them from staying on and pursue their career. While concluding, she spoke about how women should let go and fantasize about holding senior positions in organizations, open to take career risks, and share the burden at home among various other tips and stop trying to please everyone. Ms Peetz addressing the gathering felt that the challenges faced by women are by and large the same world over and she was no exception. As mother of two children, she said that there were times she wanted to quit because of the guilt of missing important milestones of their children but she held on, but when she finally decided to quit, her own family encouraged her and supported her not to quit but to go on and become the President of BNY Mellon. So, what were the critical factors of Ms Peetz’ success: In addition to her educational qualifications, she held on to her career, worked hard, sought and got the support of family, and had the courage to move up. Google her to find more about her accomplishments. All the eWIT members who attended felt so great and inspired and wished all the members had an opportunity to listen to Karen. eWIT organized a Networking event on October 25th, 2013 with women delegates from Nepal, Bangladesh, Sri Lanka and the Maldives. It was an evening, with an opportunity to network with and listen to women delegates representing various women empowerment organizations and entrepreneurs from India’s neighboring countries! It was interesting to listen to what their forums do & also understand the challenges women face there. eWIT conducted a Networking event at the Auditorium of Exemplarr World Wide Pvt. Ltd., a corporate member of eWIT. 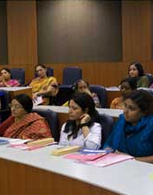 The event received about 15 delegates mostly women entrepreneurs from neibhouring countries such as Srilanka, Maldives, Bangladesh, Nepal who are part of South Asia Women's Entrepreneurship Symposium (SAWES). Their trip was part of their exposure visit to India. eWIT was proud to invite them and share what eWIT is doing currently to women in IT field. The women delegates were Ms. Salma Masud, Vice President of Women Entrepreneur, Association of Bangladesh (WEAB), Executive Member of SAARC Chamber Women Entrepreneurs Council (SCWEC) and Ms. Luna Shamsuddoha, IT Entrepreneur Dohatec New Media, from Bangladesh. Ms. Sheeza Imad, Women’s Economic Development and Ms. Shaira Saleem, Women’s Economic Development from Maldives. Ms. Mangala Karanjit, General Secretary, Federation of Business and Professional, Women Nepala and Ms. Sabita Maharjan, Kirtipur Hosiery Industry from Nepal. Ms. Rezani Aziz, Chief Operating Officer, Strategic Alliance PR and Ms. Shirly Jayawardena, Chaiperson, Central Province Women’s Chamber of Small Industries and Commerce from Sri Lanka. Ms. Rajni Aggarwal, President, Federation of Indian Women Entrepreneurs and Ms. Meenakshi Rathore, Adishma Exports from India. Ms. Mani Mekalai from Women Entrepreneurs Association of Tamil Nadu (WEAT) and professor in the Women's Studies Department and as a Professor of Economics, supporting women by founding WEAT through the Department of Women's Studies, Bharathidasan University, Triuchirapalli and help the women to be get economically empower through Entrepreneurship and Ms. Mythili from Women Entrepreneurs Association of Tamil Nadu. Ms. Kalyani Narayanan, President, eWIT welcomed the delegates and other guests and gave a presentation on eWIT and its work in the field of women empowerment.After which Ms. Reecha, Program Officer of Asia Foundation thanked eWIT for the opportunity and invited the women delegates to talk.Each delegate introduced themselves and shared their part of work towards women empowerment. During their talk Ms. Mani Mekalai said WEAT has succeeded in introducing women into non-conventional areas of entrepreneurship say Engineering and Fabrication, etc. Some of delegates like Ms. Luna from Bangladesh and Ms. Mani Mekalai of WEAT expressed their intention of collaboration / tie up with eWIT. Ms. Kalyani Narayanan, President of eWIT welcomed the idea. Ms. Usha Srinivasan, advisor, eWIT gave a thank you note. 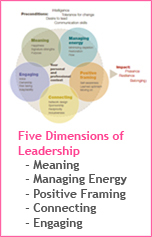 Says Mckinsey Quarterly Report, Our research is exploring the hypotheses that today's leaders can become even more effective through the model of centered leadership: a shared purpose with deep meaning for the people involved, explicit awareness and management of energy, positive framing, strong informal and formal networks and the collaborative creation of opportunities. One useful tactic is to identify the conditions and situations that replenish your energy and those that sap it. Self- awareness lets you deliberately incorporate restorative elements intor your day. It can also help you to space out your energy -sapping tasks throughout the day instead of bundling them into a single morning or afternoon. A particularly useful tip, wae have found, is to give yourself time during the day to focus without distractions such as blinking lights and buzzing phones. Your productivity will benefit several times over. No matter how possimistic you are by nature,you can learn to view situations as optimists do. The key is self-awareness. If a meeting goes badly,for example, you should limit your thoughts about it to temporary and specific impact and keep them impersonal. It helps to talk with trusted colleagues about the reasons for the poor meeting and ways to do better next time. These discussions should take place quickly enought for you to make a specific plan and act on it. You should also undertake some activity that will restore both your energy and your faith in yourself - perhaps having a hard workout, going out with friends, or spending time with your children. People with strong networks and good mentors enjoy more promotions, higher pay and greater career satisfaction. They feel a sense of belonging,which makes their lives meaningful.Women's networks tend to be narrower but deeper than men's. It is important to also have good relationships with senior colleagues who go beyond the role of a mentor and is a person willing to stick out his or her own neck to create opportunities for or help a protege. Such a person is a 'sponsor'. A senior partner at Mckinsey noted that men naturally understand that you must 'give before you get',but women don't. This tendency combined with awkward sexual politics,real or perceived,between senior men and younger women,makes it harder for women to find sponsors. To start, it's important to assess your comfort level with the people you know through work, as well as how influential they are professionally. Most women we've worked with typically find that the colleagues they are close to are not influential - and vice versa. Explicit planning and some risk taking are needed to change this. One approach is to provide and ask for help on a regular basis. Finding ways to forge connections through interests outside of work is another. 'Make it personal', in the sense that ,others will get along with you more if they get to see your human side. Many people think that hard work will eventually be noticed and rewarded. That can indeed happen- but usually doesn't.Women, interviewed said that it is needed to 'create their own luck'. To engage with opportunities by taking ownership of them, your must find your own voice. Senior women on boards still lose out by not speaking up: they hang back if they think that they have nothing new to say or that thier ideas fall short of profound. Another approach is to look inward - 'like the Japanese Auto Industry metaphor'and improve on areas which an individual feels needs to be changed. This can be done instead of waiting for someone else to point out what needs to be done. Engagement is equally about risk taking. Some have the confidence and courage to dive in, other use analytic problem solving to assess risks and then proceed to action. To embrace opportunity, people must often take sharp detours and that the risks of unexpected change seems more obvious than benefits. Says Mckinsey, Our research is exploring the hypotheses that today's leaders can become even more effective through the model of centered leadership: a shared purpose with deep meaning for the people involved, explicit awareness and management of energy, positive framing, strong informal and formal networks and the collaborative creation of opportunities. In time, we hope to help increase the number of female leaders significantly by giving them tools to build leadership skills for any playing field. Venture capital firms that invested in women-led companies outperformed those that didn’t, according to a new analysis of a decade’s worth of VC deals. What’s more, the VCs that did invest the most in women entrepreneurs were less ingrained in the Sand Hill Road network . The study, also found that after VCs first invested in women entrepreneurs, they were more likely to do so again. The VC world has long been criticized as an old boy’s club. Even when venture capitalists dismiss charges of gender bias, many are quite explicit that they want potential deals to come through trusted referrals. If women entrepreneurs are shut out of those networks, they may not get the consideration that male counterparts do. The world’s most successful women really want it–and remain determined even in the face of obstacles. They have the skills, and they put the time in. But more importantly, they have the desire to do something great. An example from Beth Brooke, global vice chair of Ernst & Young,who was diagnosed with a degenerative hip disease at age 13 and was told by doctors she may never walk again. Women at the top aren’t fearless. They move toward their fear to continually challenge themselves. That takes courage. In order to achieve big success, you have to have big impact. So says, Michelle Gass, who is now leading 33 countries for Starbucks, started at the coffee chain, she was asked to architect a growth strategy for a just-launched drink called the Frappuccino. Her mantra: “Let’s think of how big this can be.” What began as a two-flavor side item is now a $2 billion platform with tens of thousands of possible combinations. Hala Moddelmog, president of Arby’s Restaurant Group, believes surrounding yourself with people of different backgrounds—including gender, race, geography, socio-economic and personality types—will help round out your conclusions. “You really don’t need another you,” she says. Similarly, staying open to different viewpoints keeps you ahead of the curve. Claire Watts, the CEO of retail and media company QVC, schedules open door times every Tuesday, so that anyone in the company who wants to come talk to her, ask her a question or share something they’ve noticed can do it then. Watch Out this space to know more about our Upcoming Events.